Hive is a boardless board game played with Hex tiles. The structure of the game is a fairly traditional chess-like game, overlaid with an insect. theme. 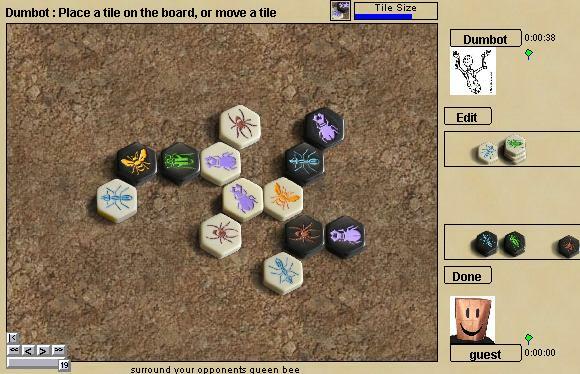 The goal of the game is to surround your opponent's queen bee. The other pieces are represented by insects (ant, beetle, grasshopper, spider) and have rules for motion which are appropriate to their namesakes. It sounds a little silly, but the game is well balanced and lots of fun to play. You can read the details in the official rules, but briefly; the pieces are played but never removed, and must always form one connected "hive". Ants run anwhere around the outside of the hive. Beetles can move on top of other pieces. Grasshoppers move from one end of the hive to the other, and spiders move only in multiples of 3 spaces. Rules Change: at boardspace the "Queen" opening has been forbidden for both black and white. John Yianni supports this change, which is intended to eliminate the problem of excess draws in "queen opening" games. Robots: Dumbot is a credible but not stellar player. The back story: There's no question about it, Hive is strangely addictive. The final straw that convinced me I wanted it here was when someone on BGG posted a picture of the hive pieces tattoo'd on his arm. That's a statement!